In a previous entry I described the total eclipse of the sun which is happening next month, August 21, 2017. Total solar eclipses are rare. How rare? It has been 26 years (July 11, 1991) and that was only seen in only one state, Hawaii. The next solar eclipse for the US will be April 8 2024. This one enters from Mexico into Texas and slices northeastward through New England exiting the US in Maine, continuing on through New Brunswick, and Newfoundland. There have been many partial eclipses, but the difference between a partial eclipse and a total eclipse of the Sun is night and day if you will pardon the obvious. The eclipse next month can be seen from the entire US as a partial eclipse but only those who are in a ribbon that is 71 miles wide at it's widest, will be able to see the total eclipse. That ribbon of totality enters the US near Portland, Oregon and exits on the east coast of South Carolina. If you are exactly in the center of the ribbon of totality, you will get about 2 minutes of darkness before the Sun reappears. Standing near the edge of the ribbon the length of the eclipse could be just a matter of a few seconds before the Sun reappears. It is going to take some planning to see this eclipse. Millions of Americans will flock to that ribbon. They will be joined by many thousands of visitors from all over the world. Now some details. States with larger populations are already issuing travel alerts and making provisions to handle the millions of people who will see the eclipse. States with smaller populations will have fewer locals to deal with but they also are states that have widely spaced roads which will concentrate crowds on the few roads in those states that cross through the ribbon of totality. RV parks, motels and hotels along the ribbon of totality are already sold out in many locations. 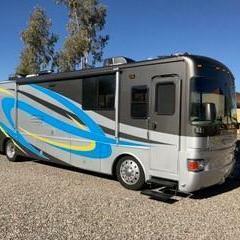 Those of us with RV's are fortunate, we travel with our motel. I would not plan to take your motor home into the ribbon of totality unless you have already secured a campground. My personal planning is to watch the weather as the eclipse approaches. I'll start watching the weather weeks before the eclipse. I plan to get close to the area with the greatest probability of clear skies with the motor home and then use the toad to get to the clearest skies with the toad. I'll try to be at my chosen observing site by sunrise and will watch the entire eclipse from that location. We'll pack food for the day, liquids and perhaps a celebratory bottle of Champagne. Once totality passes, many people will start for "home." This can create tremendous traffic jams so plan to sit tight and watch the whole show before departing your observing site. Where do you find specific details? I gave several references in my entry several months ago. More are available now as the eclipse approaches. 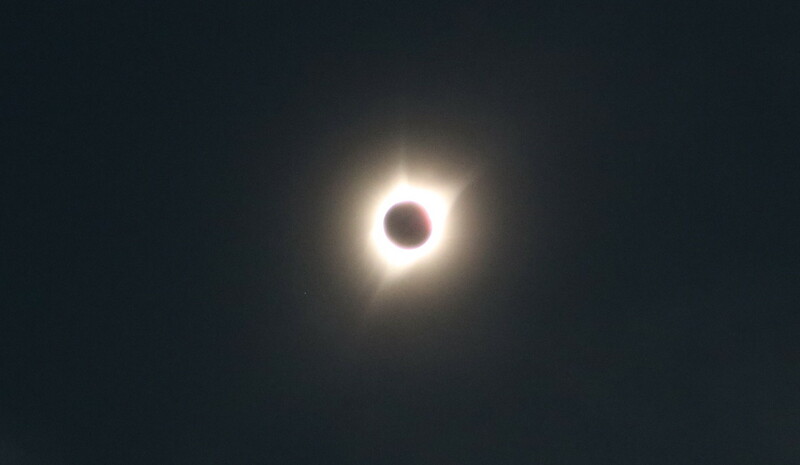 There are good sites that show details of the ribbon of totality so you can position yourself precisely on its center line. Many of the sites have eclipse glasses for sale. These protective glasses, some with aluminized mylar are quite cheap but very effective, are necessary for the partial phases of the eclipse. Once the sun is completely covered the glasses can be put aside and you will be looking at one of natures most spectacular displays. The Moon is the dark spot, silhouetted against the light of the corona of the Sun. You may discern a drop in temperature as totality approaches. Birds will be singing as though it was sunset coming on. Listen during totality, can you hear any birds chirping? At totality, the sky becomes dark enough that planets and bright stars can be seen. Using binoculars (during totality only) you can get a good look at solar prominence which look like small red "flames" rising from the Sun. If we are lucky we may even be able to see other features. Large solar ejections and flares can cause the corona to have strange shapes. Whatever you see, it will be an event you will never forget. Space.com - Great detail, how to photograph, what to look for. Each link has it's own special information, most have eclipse glasses for sale, as does Amazon. Order soon, don't be disappointed. Your eyes are way too important to take chances with someone's home-made eclipse viewer. I ordered 50 glasses for less than $1.00 each. Previous entry Whose Idea Was This? TBUTLER where are you planning to be, we have reservations at Thousand Trails, Fair Play, South Carolina. We are going to be in the Denver area in August. I'm looking at eastern Wyoming and western Nebraska as my primary choices. I'd probably prefer Wyoming for the altitude but the road system in Nebraska is more robust. Like I said, I'm planning to decide in the days or even hours leading up to the eclipse. The greatest disappointment comes when you are sitting under clouds during the eclipse. I did that in Hawaii (the Big Island) in 1991. Hawaii has a single road that circles the island. There were really only two places to watch the eclipse, I chose the desert side and it rained on us! Having an eclipse "at home" with all my resources available and a great road system, I'm going to take advantage of everything that is available to me. We are lucky enough to live about 30 miles from totality and plan to drive to my uncles place near Lake Murray in South Carolina. As there will be a few family members traveling in from other states, we are making a long weekend event at his house. We plan on dry camping on his property. I did order some viewing glasses a while back on the cheap. I've seen a deduction of the cost from my bank account but no glasses yet. I'm going to see what's available locally if they don't show up soon!